“The sun was a ‘globe of red hot iron’ the day before the quake came; the animals restless and uneasy. But no one was prepared when the tremors began early in the morning of December 16, 1811. They would last almost two years – with major shocks interspersed with the minor – destroying much of the bustling port of New Madrid, and sending its citizens fleeing for firmer ground.” According to Wikipedia, some of the major quakes reached a magnitude of 8 and were felt as far away as the East Coast. 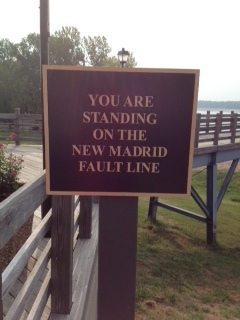 New Madrid lies on the appropriately named New Madrid Seismic Zone – the source of intraplate earthquakes in the southern and midwestern United States. This citizens of New Madrid seem to take it in stride; our tour guide says after you’ve lived here a while, it becomes normal for your walls to shake a bit! Like I said, I couldn’t face another museum, so I just walked around the town a bit. During my walk through New Madrid’s downtown, I ran into a very nice gentleman. I didn’t get his name, but I would like to share his story. I met him in New Madrid’s little park dedicated to men and women from New Madrid County who served in the armed forces – from WW!! to the present. I asked him if he’d lived in New Madrid his whole life, and he told me he had moved to New Madrid from eastern Tennessee many years ago. What brought him to New Madrid? He was serving in Vietnam, and a buddy from New Madrid sent a list of names (including my friend’s) to his sister, who posted the list in the local welfare office. I surmised that these were the names of soldiers who were looking for pen pals. Well, one young lady ran her finger down the list, settled on my friend’s name, and started corresponding with him. A few months later, they were married and settled in New Madrid. Forty some odd years later, they are still happily married with three grown children. A lovely story, I thought. That story made me love New Madrid a little bit. Thank you, sir, whoever you are. After a day of steamboating yesterday – during which I basically did NOTHING (hey, it was crazy hot and humid yesterday! Don’t judge) – we’re in Paducah today. 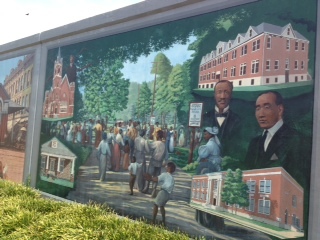 Many, many years ago, I passed through Paducah from Atlanta on my way to St. Louis. I was spending Christmas with my sis, who lived in STL at the time. My ill-fated trip to the top of the Gateway Arch probably happened during this visit. Anyway, I passed through – never stopped to visit. 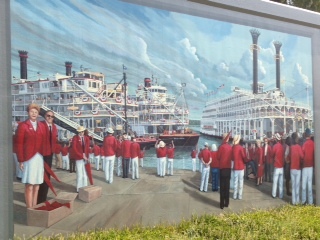 Paducah is a river town, located at the confluence of the Ohio and Tennessee Rivers. Apparently, this was a valuable port city back in the day, with a drydock for steamboats and towboats, and a railway hub. Kentucky was a key state during the Civil War, and was officially neutral at the beginning of that conflict. However, slaveholders continued to keep slaves. In September 1861, forces under General Ulysses S. Grant captured Paducah and took control of the mouth of the Tennessee River. Thus, Paducah became a key supply port for Union gun boats and supply ships. Paducah’s a port city. 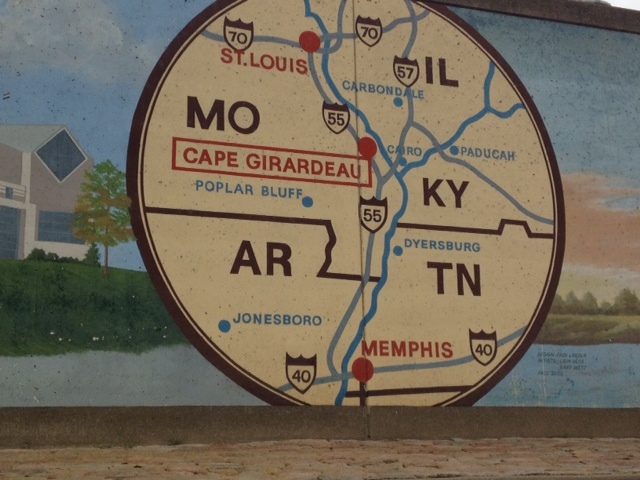 Like Cape Girardeau, the city constructed a flood wall – built by the Army Corps of Engineers – to protect it from rising waters. 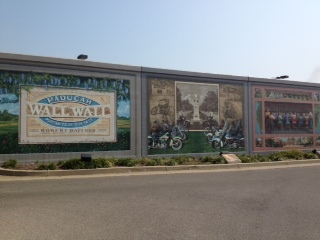 What I love about it is that – again, like Cape Girardeau – Paducah uses the flood wall as a canvas that portrays the city’s history. In 1937, the Ohio River crested to 60.8 feet, flooding the city for three weeks. 27,000 residents were forced to evacuate. So yeah, I guess they needed that flood wall. Paducah is something of an artists’ colony. According to our tour guide, in 2000 the city began its Artist Relocation Program, recruiting artists to move to Paducah and revitalize the rundown Lowertown neighborhood. It appears to have worked: the neighborhood’s old Victorian structures have been restored and the area is on the National Register of Historic Places. I realize this is not the place to discuss real estate values, but let me just say that it makes me a little ill to realize that I could buy a two bedroom, two bath HOUSE in this town for half of what I paid for my two bedroom, one bath CONDO in Arlington. I know, I know: it’s a trade-off. Still makes me sick. Anyway. Paducah, also known as “Quilt City,” is home to the National Quilt Museum. Apparently, 35,000 rabid quilters descend upon the city every year for the annual quilting show or conference or contest or something. Winning quilts are placed on display at the museum. The museum also displays quilts from the Civil War era. (No photos allowed in the museum, so unfortunately, I have nothing to show you here). Look, I freely admit that I know absolutely nothing about quilting. I saw some beautiful designs, I’ll admit. But it’s a little hard for me to get excited about an award-winning quilt when I read that it was produced by machine. Yes – these machine-made quilts were lovely and perfect, and yes – it was easy to see the flaws in the quilts stitched a hundred years ago: slightly misaligned panels, wobbly lines, etc. I think I prefer the hand-stitched ones, flaws and all. I mean, how much credit can you give the quilter if the machine is doing all the work? It sounds like knitting by machine. Yes – if I knitted by machine, my sweaters and scarves would probably look a lot better than they do…but that feels like cheating to me. And so, onward. We depart Paducah tonight and head for New Madrid, MO. Cape Girardeau is just a memory now. What can I say? It is a small town. The people are friendly. The murals on the flood wall were interesting. Rush Limbaugh is from here. Gross. We were there on Sunday, so most of the shops were closed. That is all. What I wanted to focus on in this post is the American Queen’s onboard entertainment. Let’s face it: we are living on this boat, so the steamboat company is doing as much as it can to keep us entertained with music, performances, movies, etc. Alcohol helps too. Last night’s premiere entertainment: Dean Martin and Frank Sinatra. Impersonators, obviously. But they were really good. “Dean” kept a cigarette (unlit of course – no smoking on the boat!) firmly grasped between his fingers and sipped regularly from his tumbler of scotch between jokes. And “Frank” came out wearing a fedora and entertained the crowd with his classics: “Volare” and “My Way” among others. Oh – did I forget to mention that I’m not the target demographic for this cruise? Let me tell you how it went down. St Louis. Saturday morning. Complimentary breakfast for the American Queen passengers in the Grand Ballroom. I walk in and see many, many retirees. Like in their 70s. “Oh. My. God.” is my reaction. No biggie, right? Surely, there are a few people my age on this cruise. Right? Right? I check in with the steamboat staff. Gotta get my boarding card, my dinner table assignment, sign up for additional “premium” excursions if I so desire. I ask the two friendly crew members who have just given my dinner table assignment: “so, is there anyone on this cruise under the age of 45?” “Yes,” they immediately respond, “the crew.” Awesome. This is my life, ya’ll. I have this amazing ability to choose vacation trips that skew older. Let’s be honest about this trip though. I think the main reason this cruise skews to the older set is 1) they have the disposable income and 2) they have the time. So I can’t really complain about being fortunate enough to have both at the young age of 42! In many ways, the age difference makes it easier to accomplish what I wanted on this trip. I wanted to relax, to decompress, to forget about work for a week, to read a lot, and to write. I’m able to do all of it. That said, if I ever do this again, I’m bringing my parents! Whew! I spent the day walking around downtown St. Louis. I forgot how easy it is to get around this town. My hotel was conveniently located in the heart of downtown, so I started my morning with a walk to the Gateway Arch. My sister used to live here, so this wasn’t my first visit to the Arch, but it was nice to see it in the peace and quiet of an early Saturday morning – just me, the river, and a few early risers. Construction on the Arch began in 1963 and was completed in 1965; the stainless steel monument is 630 feet high – the tallest man-made monument in the United States. Did not know that. 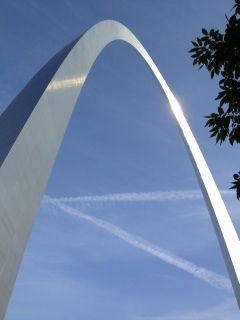 Last time I was here – which was many years ago – my sister and I rode the car to the top of the Arch. There are windows up there, so you can look out over the city. And you can feel the structure sway a bit when it’s windy. Let me just tell you now: I have no photos to document this experience. I’m afraid of heights, so I had to be cajoled into taking this little excursion. Once at the top, I stood in the middle of the room not looking out of either set of windows. So lame. My sister got a real kick out of it. By mid-morning, the temperature really started to rise. No more cool, breezy morning. I walked to Busch Stadium, snapped a photo of the Tums building along the way, and then headed back to the hotel’s cafe for a rest break. Once I was sufficiently revived, I caught the MetroLink to Forest Park, where visitors can find the St. Louis Zoo, the St. Louis Science Center, and the St. Louis Art Museum. First, let me just say that I really enjoy St. Louis’ light rail system. The cars are clean and air conditioned, and the PA system works well (at least when I rode it today), and the maps make sense. Granted, the MetroLink routes are not as complex as the DC area’s Metro system – MetroLink only goes east to west – but it’s still a good rapid transit system. I think all of the stops are above-ground, so there are no complaints about adequate lighting (I’m looking at you WMATA!) and the system takes you to many of the tourist hot spots. I give it a B+ (deducting only because of the limited lines). In Forest Park, I stopped by the Zoo. By this time, it was about 93 degrees outside, so I wasn’t really in the mood for a long stay. And my timing was bad: most of the animals were hidden from view in an effort to escape the heat. I did manage to catch a glimpse of a rhino, a few Asian elephants, and a hyena. Forest Park is massive – 1,371 acres (according to Wikipedia), smack dab in the middle of the city. The park opened in 1876 and hosted both the Louisiana Purchase Exposition and the Summer Olympics (both in 1904). The park is known as the “heart of St. Louis.” I wish I’d had time to explore more than just the zoo, but I was on a bit of a time crunch. I know, I know. It’s been a while. I have been really lazy about visiting DC’s monuments and historic sites. But I’m turning over a new leaf! This post is going to be short and sweet. It’s late and I’m tired. I just arrived in St. Louis, Gateway to the West. 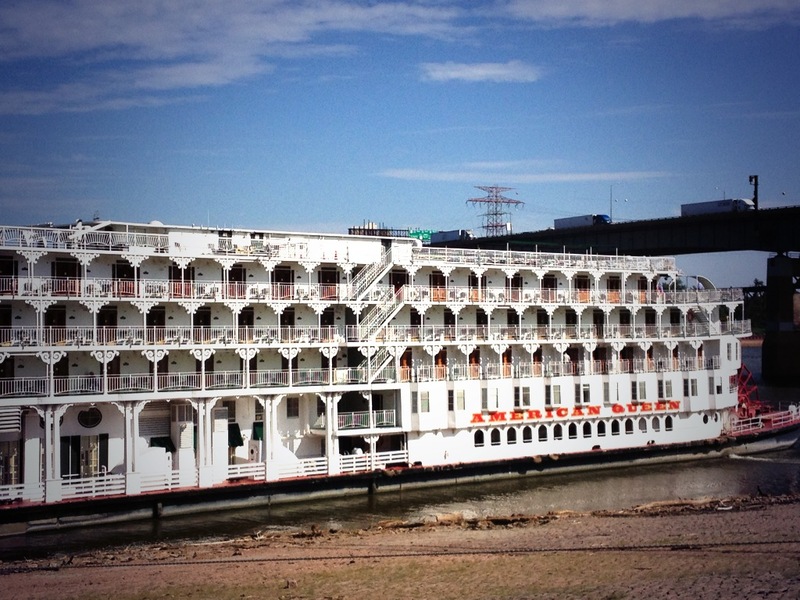 Tomorrow I will board the American Queen, a boat that cruises the Mississippi and Ohio rivers. In my Foreign Service career thus far, I’ve travelled to some interesting – sometimes exotic – places. I figured it was high time for an adventure in the good old USA.